Since it is National Soup Month and it has been pretty cold here at night, I had to make some more soup. Tomato basil was the soup of choice this time. 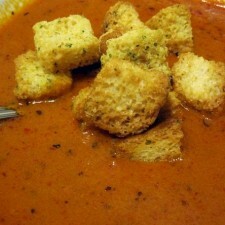 I found a great recipe and decided to take my first stab at making homemade tomato soup. If I do say so myself it turned out pretty good! Although I really do need to invest in a stick blender to make it that much easier. I added some croutons on top and it was the perfect meal to warm me up on a cold night. You could also add a grilled cheese on the side if you are really hungry! Don’t forget to use coconut oil on your bread instead of butter when grilling your grilled cheese. Puree, along with the basil leaves, in small batches, in blender, food processor (or better yet, one of those handy hand-held food blenders, right in the cooking pan). Return to saucepan and add cream and coconut oil, while stirring, over low heat. 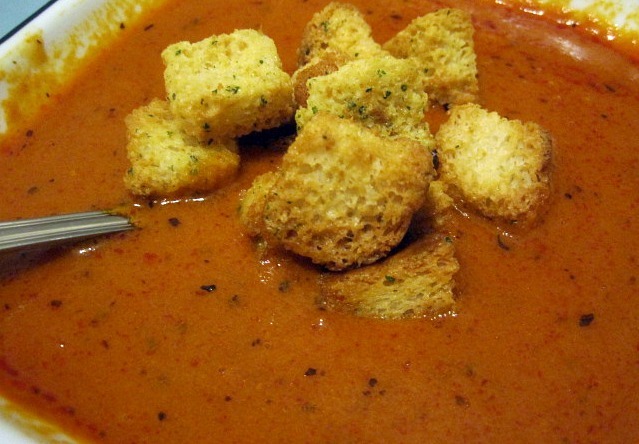 Garnish with croutons and serve with a yummy grilled cheese.